Bring 4 cups of water to a boil. Remove from heat and add 4 bags of mint tea. Allow to steep for 10 minutes. 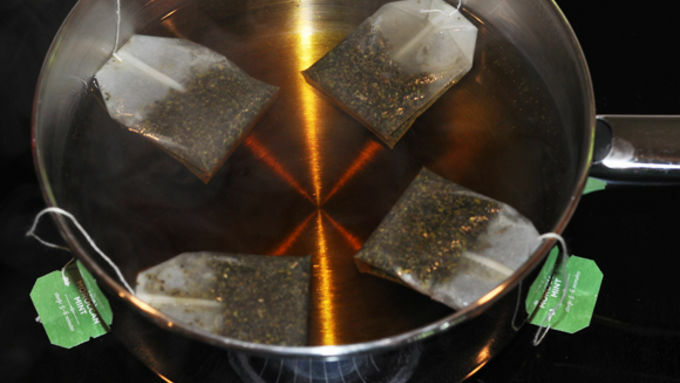 Discard tea bags and pour tea into a small pitcher. Refrigerate for at least 3 hours or until well chilled. Chill tall glasses in fridge or shortly in freezer, if desired. Add crushed ice, 1 cup of tea, sweetener (if desired) and 1 or 2 tsp lime juice, depending on how tart you like your tea. Stir. Add 1/2 cup sparkling water. Squeeze mint sprig and add to glass. Garnish with half a lime slice, if desired. 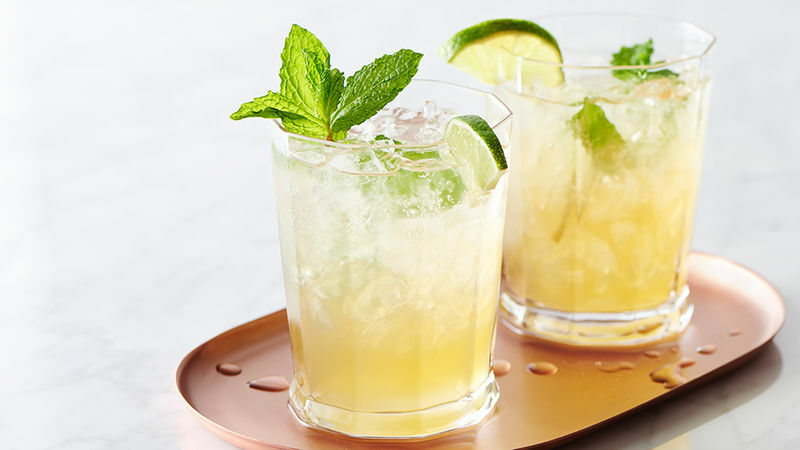 Move over mint julep, we've got another icy mint drink that's as refreshing as the day is long. (And you don't hafta be 21 to drink it!) 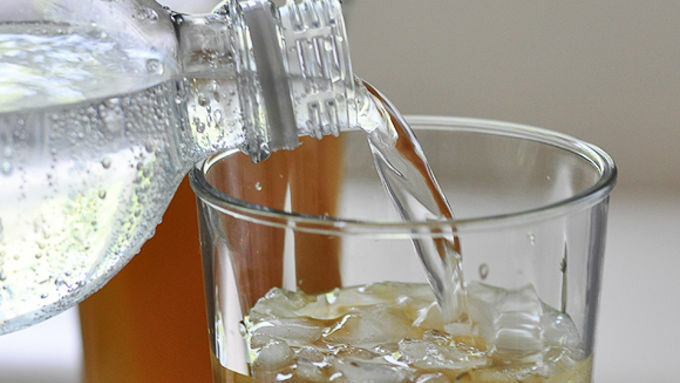 Sparkling iced teas are bubbling up at coffee houses all over the place. I've tried 'em ... and I like 'em. One of my faves is this outgoing extravert of a sipper that makes BFFs out of minty iced tea, fresh lime juice and sparkling water. Bubbly Mint-Lime Iced Tea. Yah, it's actually as simple as it sounds. Perf for a chat with your gal pal. Refreshing when chillaxin' by the pool. Incredibly awesomest when you come in after mowing the lawn. Beer? Ok, if you must. But this sure wets your whistle great too when you're sweating with the best of 'em. And, since you make it up ahead of time, it's there to greet you when you're wishing you had bought that super-deal window A/C unit you eyed up at the garage sale last week. Slurp, baby, slurp. Just about as grand as a come-from-behind win at the Derby. And mint julep fans, if adding a dribble of bourbon to your tea would make you eternally happy, be my guests.